Our first time in Da Lat guide is a compilation of the town’s most popular things to see and do, as well as places to shop and stay. Dubbed ‘Le Petit Paris’, this quaint town is 1,500 metres above sea level, giving it a refreshingly cool climate all year round. Vietnam is known for its hot and humid climate, so Da Lat is a popular weekend getaway among locals and expats. Perfect for first-time visitors, make sure you bookmark this simple yet informative Da Lat survival guide to help you to discover some of our favourite attractions, restaurants and hotels in this fascinating town. Da Lat is famous for the wide variety of flowers, vegetables and fruits to come from its surrounding farmland. The town is also ringed by countless nature and cultural sites, including beautiful landscapes, evergreen forests and minority villages. The area’s main sources of income are agriculture and the tourism industry, but the city is also very proud of being an education centre that produces multi-field professionals each year, including doctors and architects. With Dalat University alone hosting more than 13,000 students, there’s a good chance that visitors will meet with young, enthusiastic and friendly Vietnamese from every corner of the country here. Despite the lack of multi-storey malls and high-end designer outlets, Da Lat still offers travellers a fun shopping experience during their holiday. This French-built town’s central area is home to vibrant day and night markets, where you can spend several hours experiencing the local lifestyle. There’s also a unique handicraft village not far from the French Quarter, where you can find breathtaking local paintings, photographs and embroidered clothing. The best place to go at night in Da Lat is nearby Xuan Huong Lake, where you can find the iconic Da Lat Night Market – a must-visit during your first time in Da Lat. There are also several bars and pubs within Da Lat City Centre. As the town is popular for its relaxing atmosphere, the nightlife scene here is quieter than it is in most cities in Vietnam. Restaurants in Da Lat mostly cater to locals and European travellers, with fresh produce sourced from the town’s vegetable farms, wineries and lush forests. It’s arguably the best town in Vietnam to enjoy fresh strawberries, asparagus, artichokes, grapes, tea and coffee. Markets and street vendors surrounding Xuan Hong Lake are known for offering authentic local specialities at affordable prices, while colonial villas and five-star hotels attract affluent visitors with their romantic settings and breathtaking views of surrounding hills and lakes. 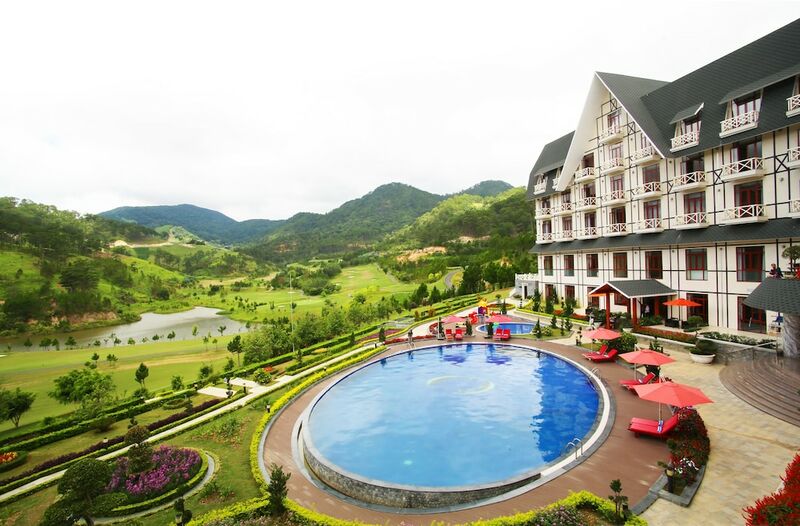 Hotels in Da Lat are set within a tranquil landscape of flowers, waterfalls, farmlands, lakes, springs and colonial French structures, making them ideal retreats for travellers looking to escape Vietnam’s busy cityscape. We’ve listed three of Da Lat’s most popular hotels, each offering value-for-money accommodation, quality facilities and warm service.